This special “how-to” episode of the WELSTech Podcast explores the steps for creating online forms to gather data. Online Forms – We wrap up our summer “Bonus WELSTech Goodness” (BWTG) series with a look at the steps for creating web-based forms. Forms are useful for easily gathering and analyzing registration, sign-up and survey information in your church and school. On this mini “how-to” WELSTech episode learn three easy steps for sharing links on your web site via a custom RSS feed from Delicious. Custom RSS Feeds – If you’ve ever surfed to a web page with news or information which would be perfect for sharing on your church or school web site, then you’ll appreciate today’s BWTG episode where Martin and Sallie discuss an easy solution for adding those desired links to your site using some RSS magic. Tune in for some delicious “Bonus WELSTech Goodness”! Creating the perfect image for your church or school web site is the subject of this mini WELSTech podcast. Web Image Editing – The current episode of “Bonus WELSTech Goodness” (BWTG) covers the basics of image editing using the free site Picnik.com. Listen as Martin and Sallie discuss the ministry applications for great images and share video tutorials, help documents and links to get you started. Learn how to setup, add content, and invite people to your church or organization’s Facebook Page on this bonus WELSTech podcast. Facebook Pages – Step-by-step instructions for creating and publishing a publicly accessible “Page” on Facebook is the topic of today’s BWTG installment. Follow the link to the WELSTech wiki site for “Bonus WELSTech Goodness” video tutorials, help documents and links to sample WELS Facebook Pages. Learn how to setup, organize and star or tag feeds in Google Reader on this mini WELSTech podcast. Google Reader – The summer BWTG series continues with this week’s share of “Bonus WELSTech Goodness” focusing on how to use Google Reader to manage RSS feeds which bring web research and professional development materials to you in a time-saving format. Learn how to create, share and embed a Google calendar on this mini WELSTech podcast. 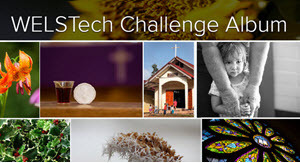 Google Calendar – Martin and Sallie kick off Bonus WELSTech Goodness (or BWTG for short), a mid-week, mini podcast series and companion wiki pages covering simple steps to put today’s technology to work in the congregation and school setting. The inaugural BWTG topic is Google Calendar, which is useful for church and school staff collaboration and display on your web site.